York University's Spark Lab Programs are week-long sessions designed for students in grades 9 to 12 who want more hands-on science. Using experiment-based learning, students explore physics, biology, chemistry and coding through lab work. Escape the traditional classroom and learn science by doing science. The Spark Lab Program is an open-enrollment program and is on a first-come-first-served basis. Registration can be completed online and a residence option is also available. Acids, bases, chemicals, and more! This course will provide students with an opportunity to explore chemistry through hands-on experiments and laboratory techniques. Students will learn lab safety and procedures, understand basic chemistry and explore different types of reactions. Different methods will also be taught to provide a foundation for students to enter into their 11th and 12th grade chemistry classes, to become more confident and capable, so that they may excel even further! Techniques such as dilution, crystallization, titration, and more will be taught in this experiment-driven course. Uncover the biological secrets at the microscopic level! Students in this course will learn many biological concepts such as mitosis and meiosis, while using a microscope to see the division of chromosomes in cells. Additionally, students will analyze the microorganisms living in freshwater bodies, identifying zooplankton, Cyanobacteria, and rotifers. Concepts such as chemical staining will be used to visualize plant and bacteria cell structures. Students will also use microscopes to solve a murder mystery and form salt and metal crystals. At MakerLab, students will get the opportunity to design, develop, and test a number of inventions! From catapults to box cars, students will learn how to build mechanical and electromechanical machines. Students will also be introduced to computer science through the use of Arduinos where they will design, code, and build robots such as a robotic prosthesis arm and a self-driving car. Join us a for a week of invention, discoveries, and more! Discover the world of vision through a biological and optical perspective. Students in this course will explore the anatomy & physiology of the eye, investigate the properties of light by performing experiments to understand the wavelength spectrum, and discuss colour vision & its disorders. From genetics to Isaac Newton, students will investigate our modern understanding of colour through this interdisciplinary course. If students are looking to explore and learn about careers in optometry or optical dispensary, this introductory course is a good start! Note: All fees are in Canadian Dollars and include HST. At Digital Hardware: Design and Development, students will learn how computers use digital electronics to process data. Throughout the week, they will build a programmable computer from the ground up using transistors, wires, and integrated circuits. Join us in this course to understand the inner workings of a computer by building the components including an arithmetic logic unit, memory storage, user inputs, and more! Unleash the most fundamental measurable quantities with this hands-on experimental physics course! From lights & lasers to magnetism, motion, and more, students will be immersed in studying physical phenomena and discussing current research in physics such as York University's work with CERN and the Hadron Collider. Students will be introduced to many essential lab techniques covered in many first- and second-year university Biology and Chemistry courses! 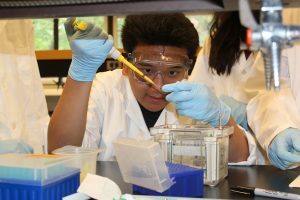 Students will get the opportunity to use laboratory tools such as micropipettes, centrifuge, spectrophotometers, and more. From gel electrophoresis to UV transilluminator, students will be able to visualize DNA or RNA molecules. Join us in Lab 101 if you are interested in exploring a career in science! From the analysis of urban air samples and quality control for processed foods to roadside breathalyzer tests and evidence used in criminal trials, analytical chemistry is a very important and useful branch of chemistry! Chromatography, gravimetric analysis, mass spectrometry, and titrations are some of the analytical techniques students will be exploring over the course of a week. Students will be challenged to think like an analytical chemist as they learn about and work with each step of the analytical process, starting from developing hypotheses and sampling, and concluding with the analysis and examination of data. This course is recommended for those taking senior science courses and for those who want to improve their scientific writing skills. All registration is to be completed online using our online system. Your spot will be reserved upon receipt of payment. Can my child bring electronic devices? Please note that we encourage participants to leave all electronic game devices at home, as we are not responsible if they are lost. If your child carries a cell phone with them, we ask that it be put on vibrate during session hours. Science Engagement Programs offers a financial assistance program to help offset some of the tuition cost of our program, so that all students can attend. Financial Assistance does not include our Residence Program. For more information, please click on the appropriate links or email helix@yorku.ca. Bursary application deadline for Helix and Spark Lab: April 15, 2019. Cancellations made 21 calendar days prior to the start of the program are eligible for a full refund, minus a $120 administration fee per child, per course. 50% refund per week of residence. Refunds will be given upon written notice of cancellation. No refunds will be made after the 21 calendar day deadline. No refunds will be given for days when a participant is absent and missed days cannot be made up. Where can I find more information about your residence program? Spark Lab students will have the opportunity to stay at one of York University’s campus residences.